Welcome To Bonnes Amies! : Burnt Red Sunflowers, bright red mums...Fall Inspiration! Burnt Red Sunflowers, bright red mums...Fall Inspiration! Early this morning it was cool and pleasant and my cottonwood trees are gradually starting to drop their leaves-perhaps Fall is right around the corner! 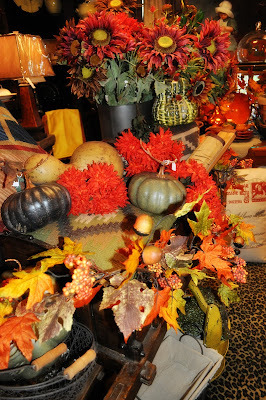 Which leads to more inspiration to decorate and start putting Fall out in our homes. So many beautiful garlands are in orange rustic leaf garlands, bittersweet twigs and garlands, and burnt red sunflowers. Mums of all different colors as well as cinnamon cider potpourri which will fill your home with the smell of Fall. Shown above is our old rustic wheel barrow full of small kilim ottomans, pumpkins & gourds, and Fall!